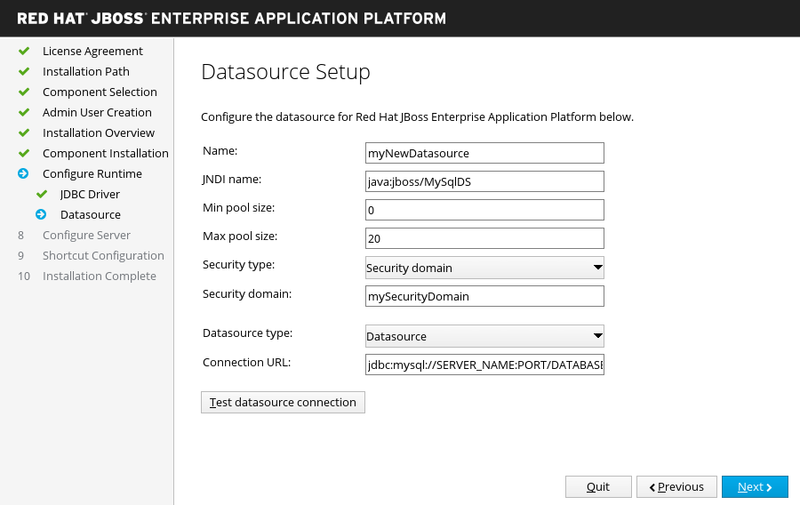 This book is a guide to the installation of Red Hat JBoss Enterprise Application Platform 7.1. 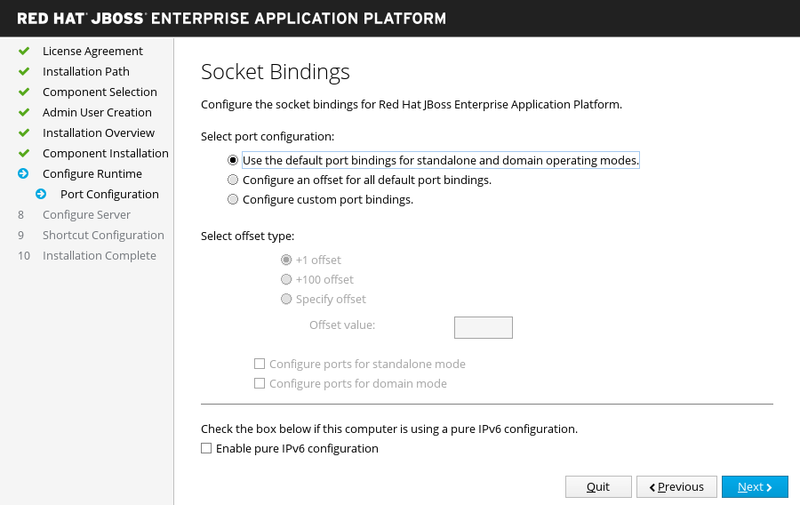 The ZIP installation provides a default installation of JBoss EAP, and all configuration must be done following installation. The JAR installer can either be run in a console or as a graphical wizard. 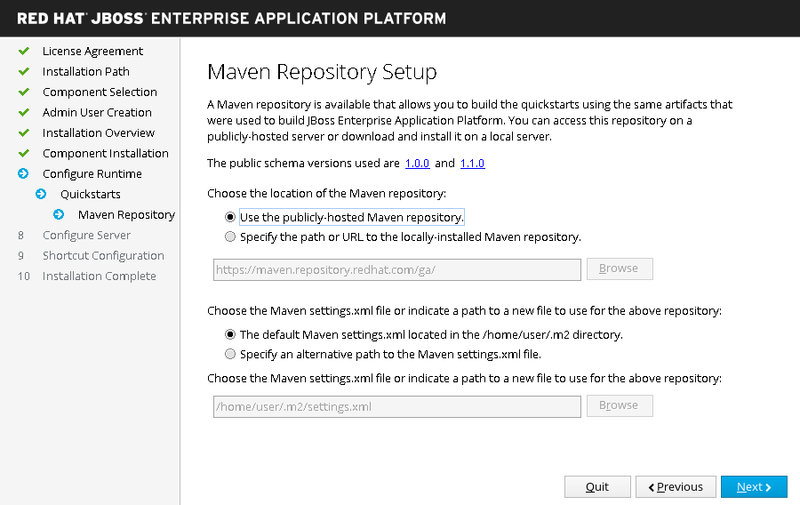 Both options provide step-by-step instructions for installing and configuring the server instance. 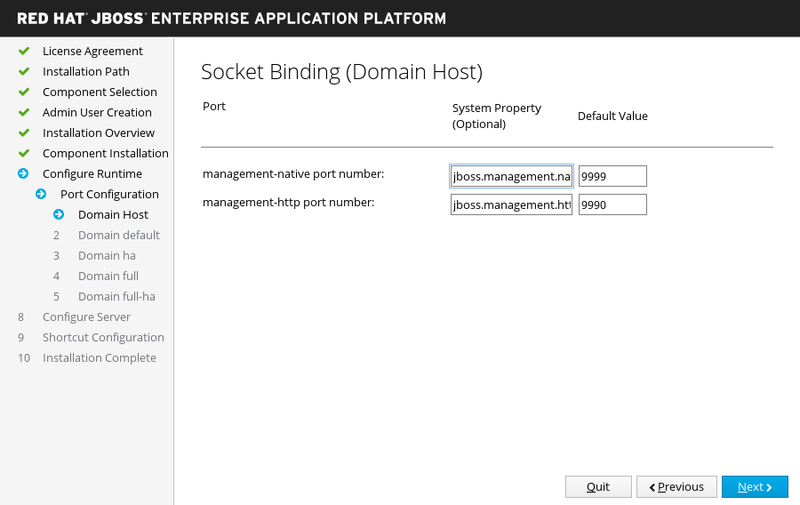 This is the preferred method to install JBoss EAP on all supported platforms. In the Version drop-down menu, select 7.1. 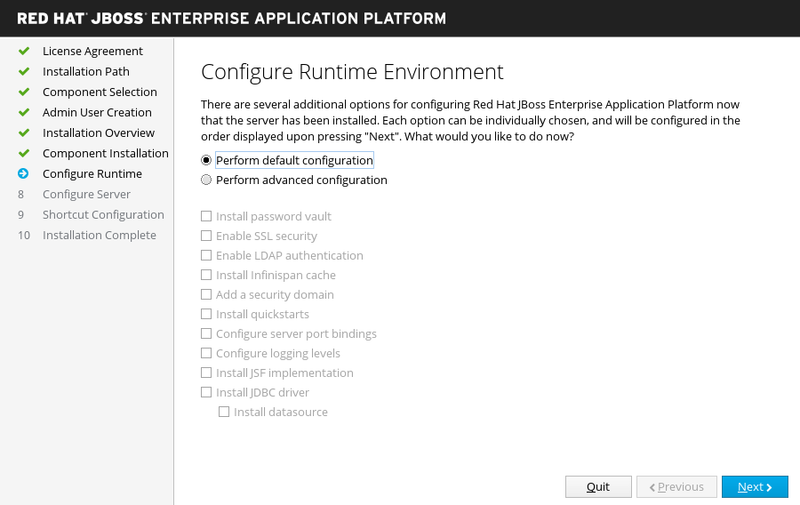 Find Red Hat JBoss Enterprise Application Platform 7.1.0 in the list and click the Download link. 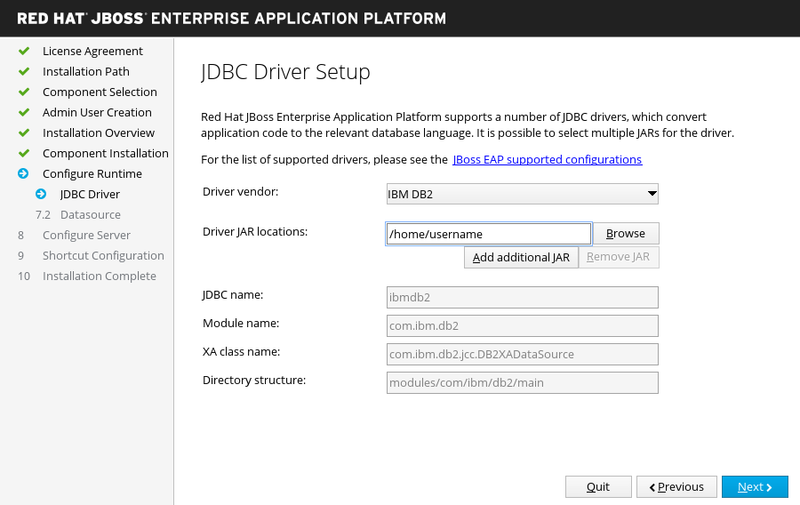 Find Red Hat JBoss Enterprise Application 7.1.0 Installer in the list and click the Download link. 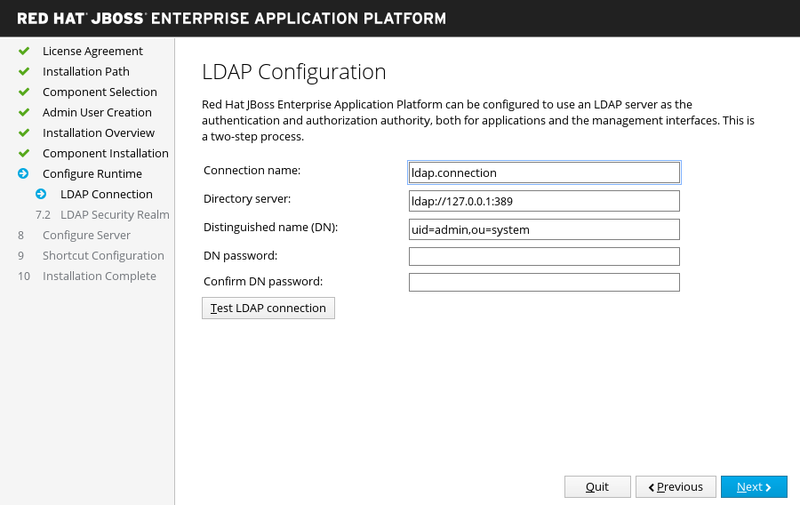 Enable LDAP authentication to use an LDAP directory server as the authentication source for the management console, management CLI, and management API. When you are done, click Next. 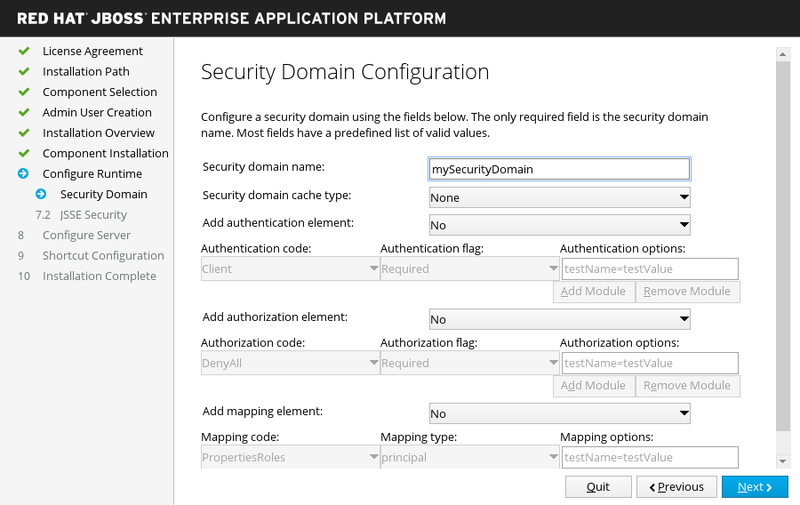 For more information, see the LDAP documentation in How to Configure Identity Management. 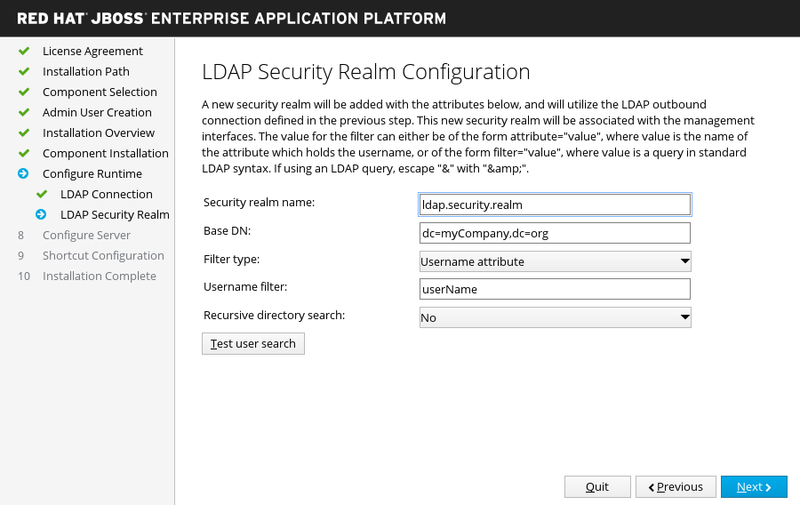 Specify the values for your LDAP environment, then click Next. For more information, see the LDAP documentation in How to Configure Identity Management. 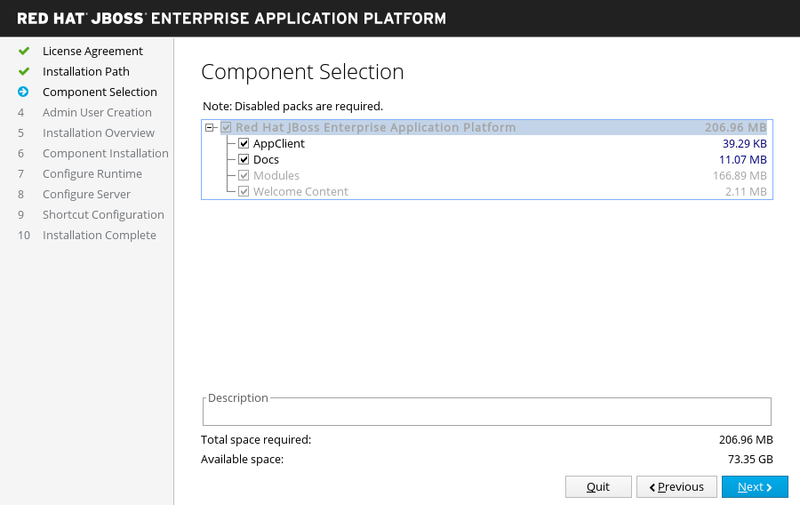 If you choose to install the quickstarts in the advanced configuration of the runtime environment. If you choose to install a JSF implementation in the advanced configuration of the runtime environment. 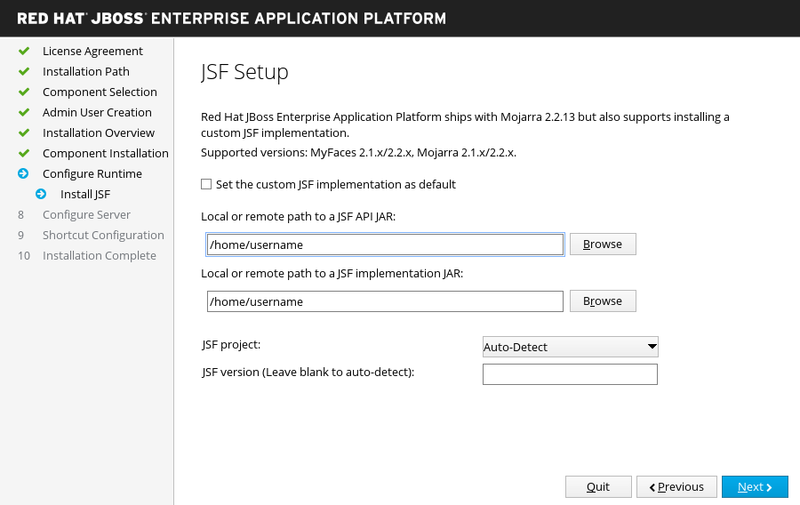 Configure the JSF options and paths to your JSF JARs, then click Next. 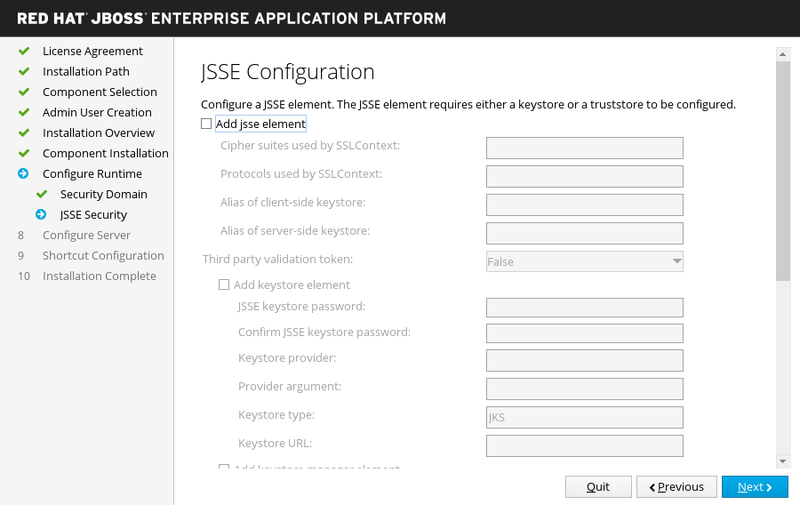 For more information, see Installing a JSF Implementation in the Configuration Guide. Select the Create shortcuts in the Start-Menu check box to create shortcuts. Only alphanumeric characters, dash (-) and underscore (_) characters are allowed. On Microsoft Windows, the slash (/) and backslash (\) characters are also allowed. Click Next. 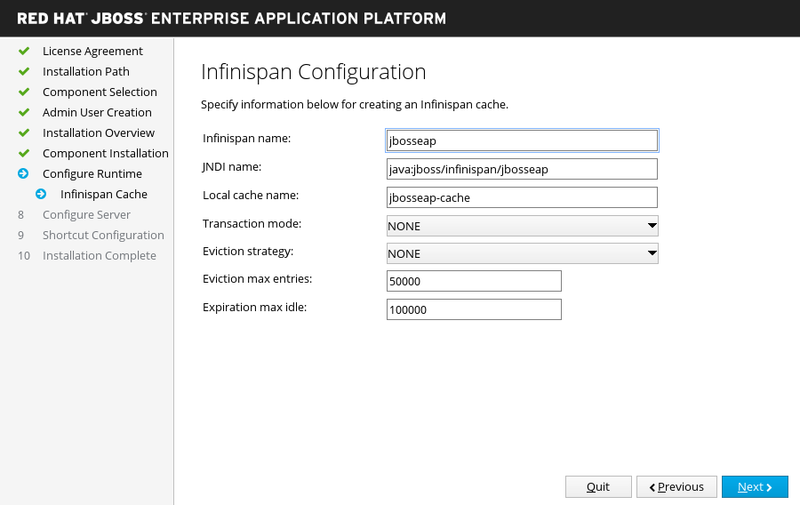 For example, updating from this repository will include upgrades from JBoss EAP 7.1 to JBoss EAP 7.2, if it is released. For example, updating from this repository will include patches and security updates for the minor JBoss EAP version, but will not include upgrades from JBoss EAP 7.1 to JBoss EAP 7.2, if it is released. Replace EAP_MINOR_VERSION with your intended JBoss EAP minor version. For example, for this release’s minor version, enter: 7.1. 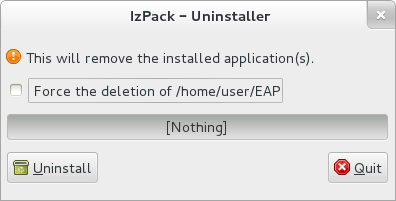 The automated installer is not backwards compatible. 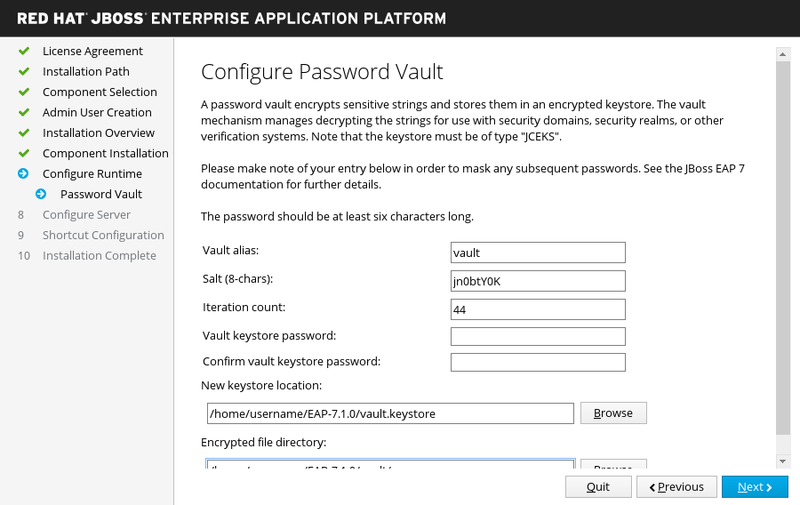 You cannot use an installation script generated from a previous version of JBoss EAP with the automated installer. 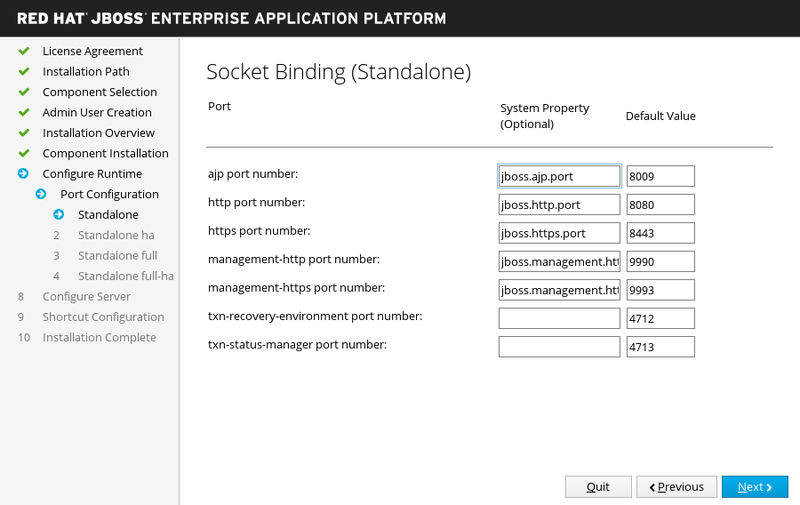 You should only use installation scripts generated by the same minor version of JBoss EAP, for example JBoss EAP 7.1.